East Rutherford Memorial Library was built in 1951 and dedicated as a monument to all those who gave of themselves in service to our country. The historic flag raising by six Marines on Mount Suribachi, Iwo Jima, occurred on February 23, 1945. The four Chaplains who died in the sinking of the SS Dorchester were: The Revs. John P. Washington (Catholic), Alexander P. Goode (Jewish), George L. Fox and Clark V. Poling (Protestant). The bottom medallion contains the figures of the Revolutionary War patriots and soldiers of the Second World War. The dates 1778 and 1943 mark the lowest periods in both wars: Valley Forge and the Battle of the Bulge.The emblems on either side of the top medallion are the Army and Navy, while at the bottom appear those of the Marine and Air Corps. In the center of the base are the crossed guns of the Artillery; the side panels contain the great seal of the United States, and on the opposite side that of the State of New Jersey. 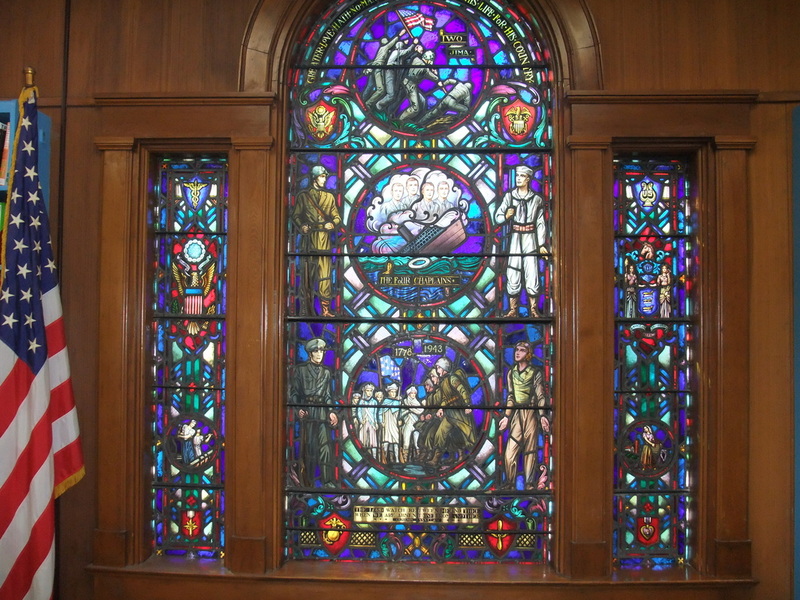 The figure panels in these openings indicate Industry and Agriculture, which, too, were of utmost importance in the war effort. The emblems of the Medical and Band Corps, with the Medal of Honor and Purple Heart, round out the symbols. The colors also carry great significance. Blue indicates enduring loyalty, sincerity and divine wisdom; red -- courage and martyrdom; green -- hope, victory and youth; yellow -- treasures in heaven and the good life; and white -- faith, purity and light.